What is the point of the initialization vector in cryptographic modes like AES-CBC when it is sent in the public? Cant any attacker just listen and reverse the IV? and as such defeating its purpose? I already know what has been said here. My question was: Cant any attacker just listen and reverse the IV? and as such defeating its purpose? Encryption schemes that use IVs will typically use results from previous block (or some counter combined with IV) to generate a pseudo-random bit stream to encrypt or decrypt the next block. Without an IV, the pseudo-randomness can be based only on the key and the message (because that is the only data that the sender and receiver will both have). Which means it would be relatively easy to get repeated blocks across similar messages using the same encryption key, especially at the start of the encryption. Depending on the mode of operation, it might result in repeated blocks elsewhere too. In addition, the IV in systems that use it is not combined in a reversible way isolated from the key. E.g. it is not simply XOR-ed into the encrypted text, or fed into the algorithm in a way that is reversible (except if you know the key it is reversible). Instead it is fed into the encryption algorithm as a modifier to the first bock of plaintext in CBC mode (when its influence changes seed generation in all consequent blocks), and/or in other modes as a modifier to the seed to the PRNG creating the bit-stream for encrypt/decrypt. To construct the full seed (and thus successfully decrypt) you need to know the key and IV at the same time - knowing just the IV would not be enough to reverse its influence. In your comment you suggest that the effect of an IV could be removed from an encrypted string, thus rendering it ineffective - because you would then have essentially the encrypted message without any influence from the IV. However, this is not possible with schemes that correctly use an IV - to perform this reversal, you would need to already know the key. The purpose is therefore to allow re-use of same key, without any chance of exposing similarities in blocks of encrypted data. If all your messages started 'Dear Fred', then without an IV block (or some equivalent additional data to feed the PRNG given the same key), the similarity would show if you used the same key, and this would give away some information about the content of your messages. As such, it doesn't matter that the IV is public, just that it is unique amongst all messages using the same key. The IV for encrypted messages is serving a similar purpose as a salt used for secure hashing. My question was: Cant any attacker just listen and reverse the IV? and as such defeating its purpose? Yes, an attacker can just listen and read the IV. In CBC mode, the IV is normally transmitted in the clear as the first block, so the attacker doesn't even have to reverse anything. No, as the IV's purpose is not to be a secret. Being secret is the key's job. If an algorithm needed additional secrecy in the form of a secret IV, the algorithm should be considered broken. Not the answer you're looking for? Browse other questions tagged encryption initialization-vector or ask your own question. What is the main difference between a key, an IV and a nonce? What exactly does a key do? Why can't you decrypt an encrypted message with just the public key? Why does rsyncrypto require a public key during decryption? How exactly are public and private keys used to encrypt and the decrypt data? 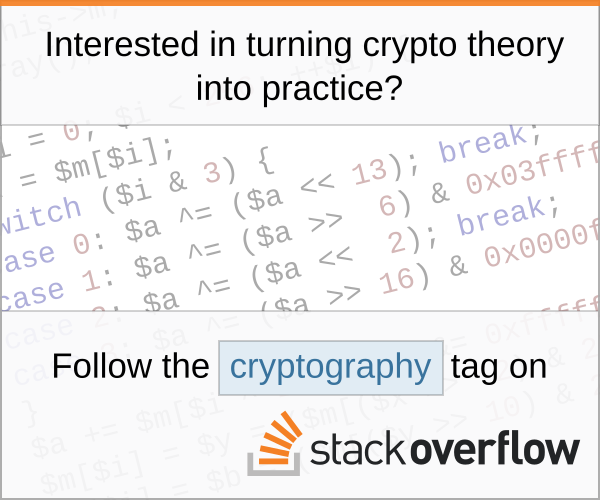 Are cryptographies based on bitwise operations considered secure? Lightweight block ciphers that support decryption with minimal overhead?